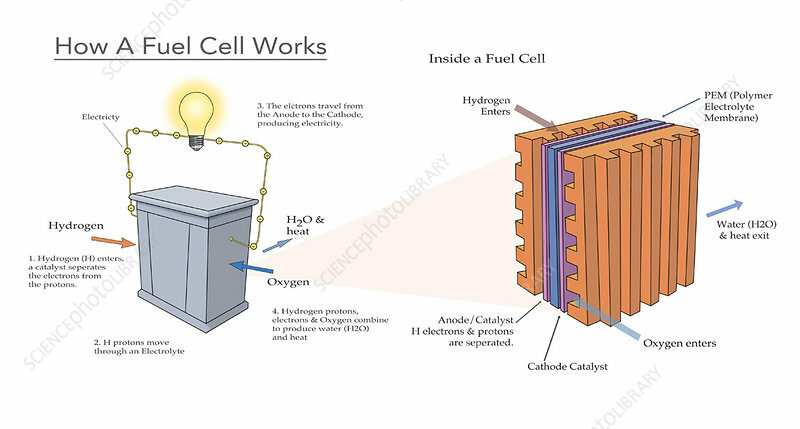 Diagram illustrating how a fuel cell takes in hydrogen and oxygen and produces electricity, with water and heat as byproducts. At left the external fuel cell is depicted, and at right is the internal cell. Hydrogen enters the cell, a catalyst separates the electrons from the protons. Hydrogen protons move through an electrolyte. The electrons travel from the anode to the cathode producing electricity. Hydrogen protons, electrons and oxygen combine to produce water and heat.